Can Childhood Obesity Be Predicted at Birth? The new calculator that helps you determine your baby's weight later in life. You may have heard the good news: childhood obesity is on the decline! Still, one in three children are considered overweight. Is your child at risk? A recent study has produced a simple formula that can predict at birth a baby's likelihood of becoming obese in later years. (It's available to the public as this online calculator.) Incredibly, the formula proved accurate not just for 4,000 Finnish children, but also in further tests using data from studies in Italy and in the U.S. Though a much publicized Journal of the American Medical Association study involving 14,000 children found that exclusive breastfeeding did not prevent childhood obesity, previous studies have indeed suggested it can curb weight gain. Experts believe it's all about self-regulation. This means that when your baby is at the breast, she learns to stop when she's full. "Research has shown that parents who bottle-feed—with breast milk or formula—are more likely to encourage infants to finish the bottle, thus not letting infants self-regulate their intake," says Lara Field, M.S., R.D., a pediatric dietitian at the University of Chicago Medicine Comer Children's Hospital. Avoid "real" food for at least four months. 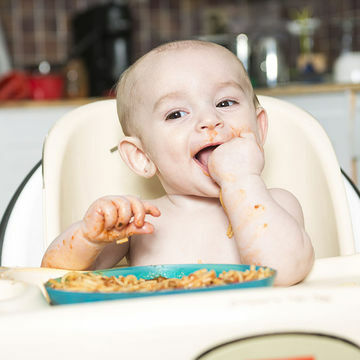 Some evidence shows that starting solids early is linked to obesity later in life. "This could be an indication of a parent's preoccupation with eating," explains Field. "If a mother is anxious to start solid foods, she may provide more than her baby needs." Field says parents should look for three signs that indicate their baby is developmentally ready for solid food: sitting up unassisted; the ability to prop up on her elbows during tummy time; and outgrowing the extrusion reflex stage (i.e., when infants thrust their tongues out). A number of studies have shown a link between not enough snoozing and obesity in children. One Harvard study found that infants who slept less than 12 hours daily had twice the odds of becoming obese at age 3 compared with those who slept for 12 hours or longer.